This is a letter written by Alexander Warner, Baxter Springs, Kansas to G. Norton Galloway, Philadelphia, Pennsylvania. 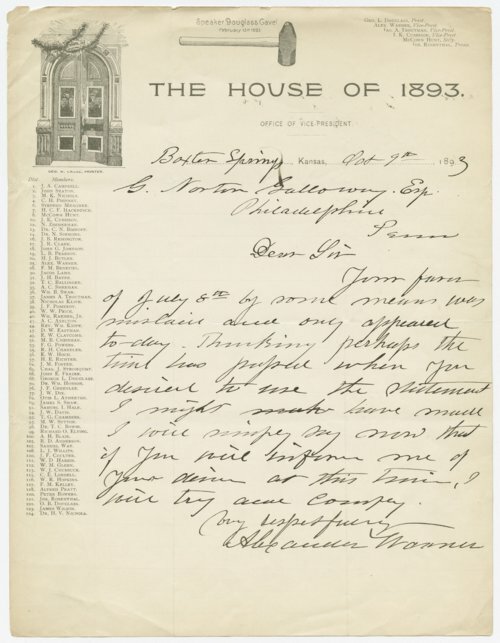 The letter is written on The House of 1893 stationery and members of the House of Representatives and officers are listed. Also, there are two illustrations one of the broken door and the other of Speaker Douglass' gavel.